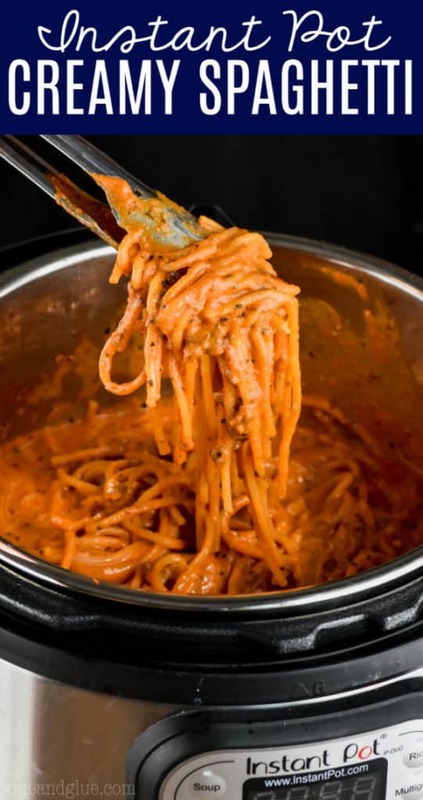 This Creamy Instant Pot Spaghetti is the amazing creamy spaghetti you love made super simple in a pressure cooker in about 30 minutes! A dinner win for sure! Serve this with a nice easy side salad and have an easy amazing dinner on the table fast! You guys. We are in the home stretch! That time in the school year when things get BUSY and you are like, “Okay. Summer. I just have to make it to summer.” We put our kids in so many activities this year, and I am so grateful for that because well rounded, smart, happy kids, blah blah blah. But OMG. I am so sick of the shuttling around and the busy schedules and the this kid has to be at this place at this time wearing this gear. And I have the great good fortune of being married to an amazing guy who does the vast majority of the shuttling. How do single parents even do it?? So as I have said up-teen million times, I am always on the prowl for fast dinners. I was talking to a friend without kiddos the other day and she was saying how she doesn’t really love crock pot meals, but she gets why parents do. I then decided to go into a soliloquy tirade about the busy schedule of a family with two working parents . . . . and she decided to still talk to me when we were done, because she is nice. ???? So! 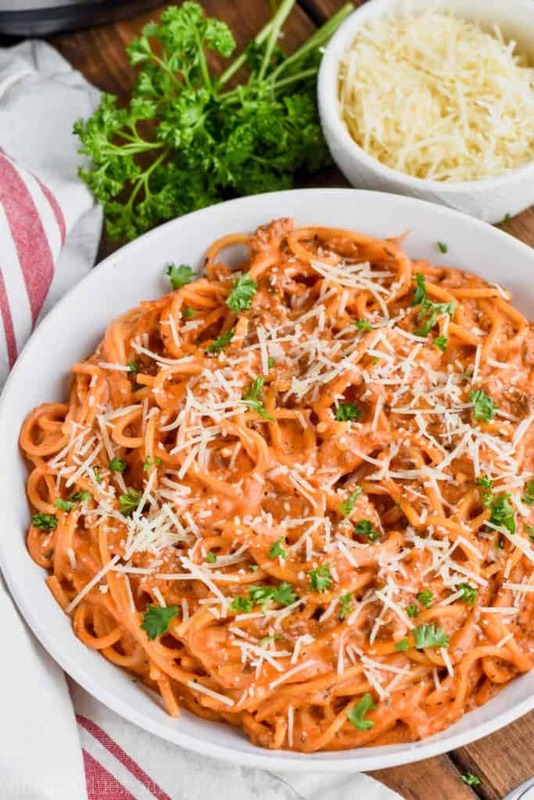 Let’s talk about this Creamy Instant Pot Spaghetti! I’m going to be real with you, friends. I am not an Instant Pot expert. I can totally use one, but developing recipes for it is a little trickier. This recipe went through a lot of variations before I finally reached out to my Instant Pot expert friend, Barbara from Pressure Cooking Today. You’ll remember her from when I made that amazing Instant Pot Chicken Enchilada Casserole from her cookbook. It was so easy and inspired me to try my hand creating these Honey BBQ Instant Pot Cocktail Meatballs. If you have an Instant Pot, you have to follow Barbara. She is constantly coming up with great recipes. Anyway, she helped me realize the one little thing that was off with the recipe, and now it is perfectly perfect! 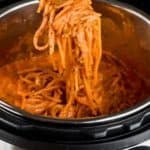 Pressure cooker creamy spaghetti is easy! And it’s totally a one pot meal, which makes clean up super easy! The key is to keep the cream cheese out of the Instant Pot until the end of cooking. That way it won’t scorch the bottom of the Instant Pot which will prevent it from coming to pressure and cooking properly. Start by turning on your Instant Pot on the sauté function. When it says “Hot” add the oil, let it heat up, and then add the ground beef. My family is a big fan of ground turkey (they only want turkey meatballs now), so you could also use ground turkey here. Brown your meat. Give it a good stir, making sure none of the meat is sticking to the bottom. Add in your spices. Add chicken stock and then spaghetti sauce. Throw in your spaghetti. You will want to break it in half. Give it a slight stir, just to make sure the noodles are all covered with liquid. Put on the Instant Pot top. Set it to sealing. Then you want to set it to manual, high pressure, and set the time for 5 minutes. After a moment it will say “On.” Then it will take some time to build pressure. When it does it will count down the five minutes. At the end of the five minute, it will beep. Turn the nozzle at the top from sealing to venting. It will take some time for the pressure to release, once the valve drops you can open the lid. Stir in the cream cheese and serve! If your family prefers ground turkey to beef, it is okay to swap that out as long as you keep the amount the same. The order you add the ingredients matters. Make sure to add the chicken stock and then the spaghetti sauce. 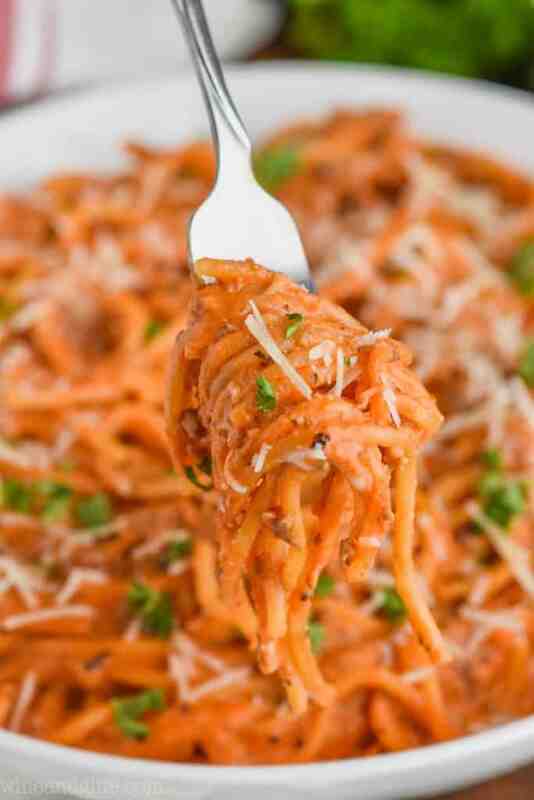 Use your favorite jarred spaghetti sauce, or just this amazing homemade spaghetti sauce. If you have little ones who struggle with eating spaghetti noodles, you could put in a different noodle. Make sure that you put the cream cheese in AFTER it is all done cooking. If not, it will prevent your pressure cooker from coming to pressure and cooking properly. 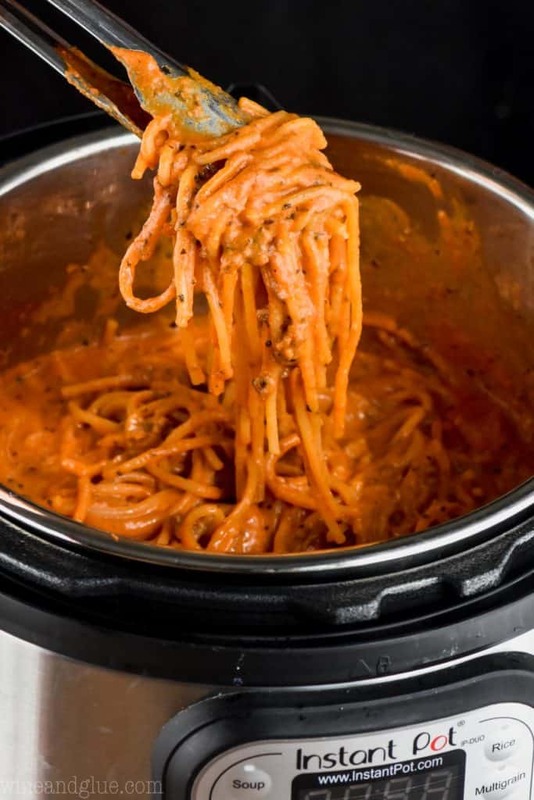 This Creamy Instant Pot Spaghetti is the amazing creamy spaghetti you love made super simple in a pressure cooker in about 30 minutes! A dinner win for sure! Turn your pressure cooker on sauté. When it says "Hot" add the olive oil. Then add the ground beef and sauté until browned and cooked through. Give the beef a good stir, ensuring that none of it is sticking to the bottom. Stir in the spices. Then add in the chicken stock and then the tomato sauce. Add the dry spaghetti and stir to cover in liquid. Put the top on your Instant Pot and make sure the valve is set to sealing. Set to High Pressure for 5 minutes. (It took about four minutes to come to pressure for me and begin counting down the 5 minutes.) Once the Instant Pot has counted down the 5 minutes, use a manual pressure release, turning it to venting. Once the valve has fallen, remove the lid. Give the spaghetti a good stir. Then stir in the cream cheese and parmesan until melted. 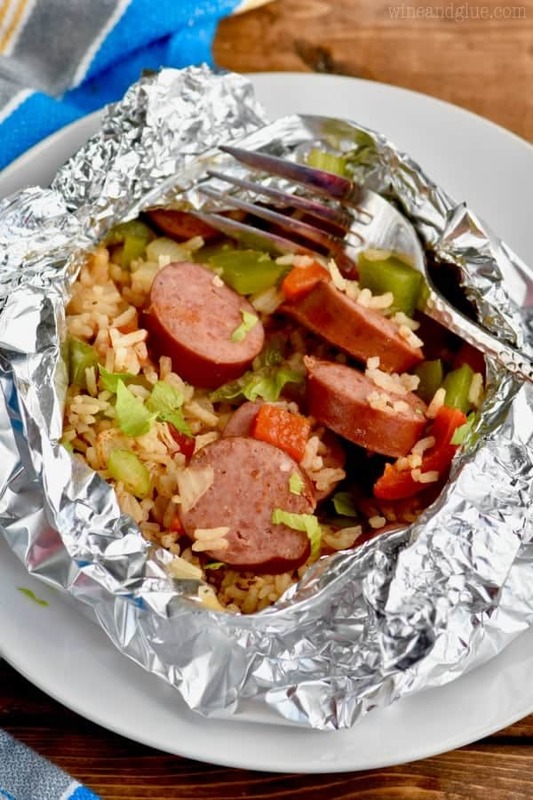 Other great easy dinner recipes! This looks so flavorful and delicious! I definitely need to give it a try. Thanks for the shout out! For sure, but I haven’t tried it that way. You would have to experiment a little. 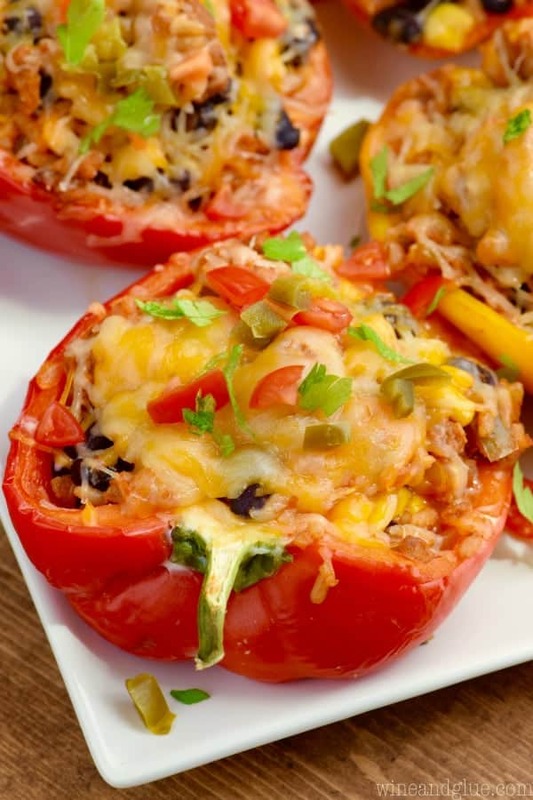 I regularly make this in the crockpot and our family loves it! Oh yes, that looks delicious! Thanks for the shout-out for my Instant Pot Buffalo Chicken Soup. 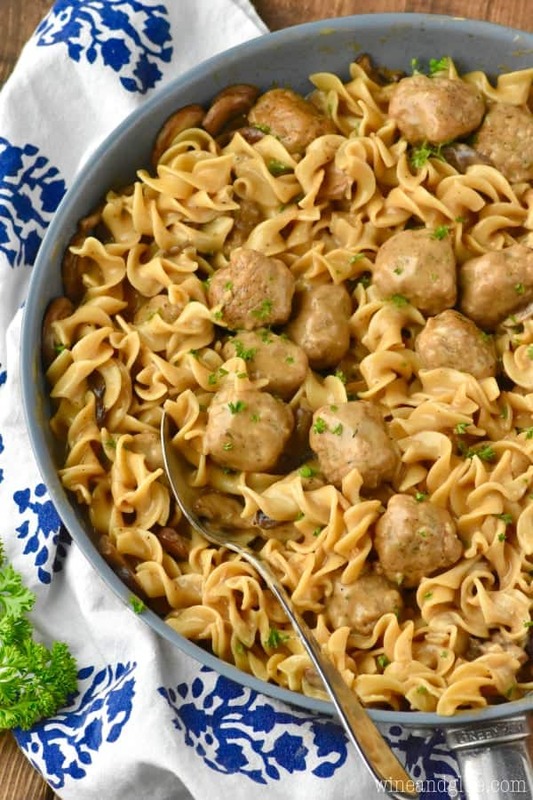 I’m not a fan of hamburger, could meatballs be used instead of ground hamburger so that I can pick around them but everyone else can still enjoy it? If so, when would you add the meatballs? I haven’t tried it with meatballs! If you do, let me know how it goes! When did you add the parmesan cheese that’s listed on the ingredients list? Thank you for catching that, Hazel! It goes in with the cream cheese!